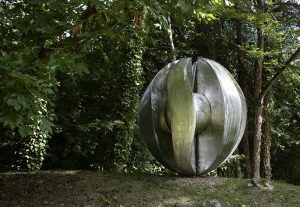 The sculptures in stainless steel are mainly realized through the boiler making process, Alain Vuillemet uses Corten steel and brass. There are generally of more than 2 meters tall, sufficiently big to occupy spaces in the open air: gardens, parks, roundabout, squares. These sculptures are shown in summer exhibits in many large cities. Sculptures d’été Arles 2009 – Jardin des Arts Châteaubourg 2011 – Musée Colette Saint Sauveur in Puisaye 2012 – Sculptures dans la ville Autun 2003 et 2013 – Sculptures à ciel ouvert Canet in Roussillon 2014 – L’Art dans les Jardins Metz – 2015 – Lumières Museum castle of Flers 2017 – Chemin des Arts St Aubin Château Neuf 2006/2017. Numerous art collectors and institutions acquired monumental art pieces. 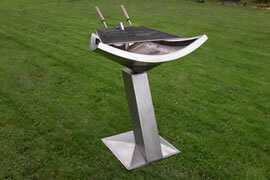 For Metallophonie ®, Alain Vuillemet essentially works with different metals, but most especially stainless steel. He explores the ability of sculptures to produce resonance. He conceives his sculptures like musical instruments, they become sound boxes capturing vibrations, sending them back at their own frequency. 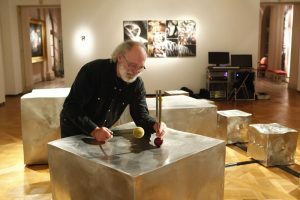 He speaks of his cubes as « sculpted sounds », a source of noise and music. Selected sounds by Alain Vuillemet are taken from a sound bank fed by recordings of the working world which are then, reworked electronically. Artifacts creation one of many facets of Alain Vuillemet’s work. 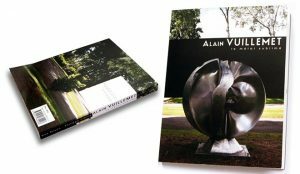 Plastician as well as a sculptor, Alain Vuillemet followed an atypical path, different ventures: publicity in the 70s, the creation of PLV (publicity at sales points), packaging, objects design, architectural scenery. Free Download book "Le métal sublimé"
By submitting this form, I agree that my information will only be used as part of my application and the ethical and personalized business relationship that may result from it.